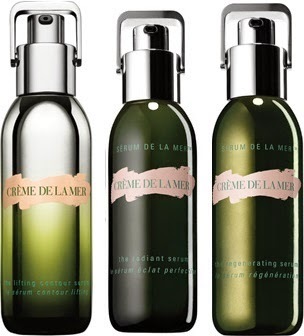 There are three different serums in the Creme de la Mer family, and over the last number of years I've used them all. I am definitely a CDLM fan, expensive and all as it is, I have found that some of their products are so beyond amazing, and when I can afford it, in general, if my skin needs a particular "thing", I'll try out the CDLM version of whatever it is my skin needs to try reset it. Case in point: the foaming cleanser that I use every morning in the shower, and the mechanical exfoliator (complete with diamond dust!) that I use once a week, the lipbalm I think is probably the best you can get on the entire planet, bar none, and the concentrate and the body lotion for almost removing some really deep-seated scars... Mind you, there are also other products from CDLM of which I am really not particularly (or even remotely) a fan. Look here if you want to read more of my CDLM reviews! This one claims that it instantly illuminates the appearance of skin as it smoothes, plumps and refines skin tone, renewing the surface skin cells and lifting dullness to reveal a fresher, more flawless looking complexion and leading to a diminished appearance of dark spots. This one claims that it sculpts and contours and firms the skin's overall appearance leading to a more refined and lifted face. This one is supposed to diminish lines and wrinkles to help skin appear refined and rejuvenated for a firmer, younger-looking complexion. The price of all of these is €275 for 30ml. CDLM is not cheap, but that's beside the point, I wanted to do the review irrespective of price, because there will always be someone out there that wants to know about this. So let's move on from the price. The single thing that I'll say about good skincare, CDLM included, is that in general a tiny amount goes a long way. One 30ml serum will last me, personally, about two years, because it's quite rich, I won't use it every day, nor will I use it in my day skincare regime, except for in the winter-time when my skin needs it. Pick one, they're all equally gorgeous on your skin. They're all the same price. They all do the same thing. The Radiant Serum and The Lifting Contour Serum are both gel-like, The Regenerating Serum is more of a gel-cream. They're all cooling and lightweight, and all are more than just a "good serum" - I love these especially in winter time for parched and distressed skin. For me however, they're too rich in the summer (I use the Infusions as a lightweight serum in this case - a review on these will follow). If I'm truly honest, I can't say I noticed a difference between any of them, nor can I honestly say that after several years of using them all, I can support any of the specific claims they make, individually, with respect to brightening or tightening or firming or whatnot. What they do they do well: they help calm the skin. They help relax it. They help lock moisture in, together with a moisturiser (in particular with a Creme de la Mer moisturiser) layered on top. They feel lovely and help my skin feel softer and generally all-round better, like a good serum should. They do help to give my skin a bit of radiance and a bit of plumping. Contouring and sculpting? Nah. Wrinkle-reducing... only in so far as they do plump up the skin a tiny bit. For a while. You need to keep using them to keep reaping the benefits. Recommended? Yes, but like I've said, the different ones don't do different things particularly. And you'll get as good a serum for a fraction of the price. But if you like CDLM particularly and like to collect everything in the range to all match up, then just pick any one of these and it'll do just grand.